Very cute! Lipsticks are great, if you are into berries. 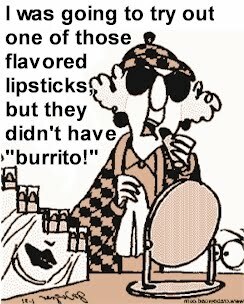 burrito flavored lipstick... now that's funny! Great Maxine this week. I don't wear lipstick but I do use the flavored lip gloss. Cherry is my favorite. Have a great day!